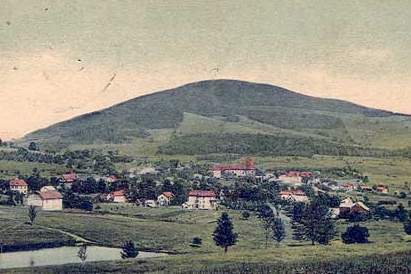 Just outside of the village of Stamford, New York, once known as “the Queen of the Catskills,” there rises a large mountain, among the taller of the Catskill Mountains. On New York State Route 10 just northeast of the village on Lake Street is a lake. Both the mountain and the lake bear the name Utsayantha. When one hears the name, one wonders where that name came from and why it is called that. Inquiry will find that there are several versions of the reason why, but all versions have a common thread. That is that they were named after an Indian Princess, and that there was a tragedy concerning her. I knew there had to be a story somewhere. A mountain and a lake could not have been named Utsayantha without good reason. I determined to find out the truth of the legend and which version was true, if any, and if not, to learn what the real truth is. I spent three years reading everything I could find on the subject. I also made inquiries of Indians themselves, among those knowledgeable of the old Indian legends of the area. I inquired from both Mohawks and Senecas as they were both known to have come into the area. It is known that the famed Chief of the Revolution, Joseph Brandt considered the area his favorite hunting area. There was nothing to be learned about Utsayantha from them. I also knew the Mohicans was in this area, but there are none left that I know of to get information from. Eventually, after three years of searching, I believe I now have the real true story of Utsayantha, where she came from, who she was and why the mountain and the lake were named for her. Where the Plattekill roars and races toward the Pepacton, (The Indian name for the East branch of the Delaware River) was a large Indian village. The Mohicans abandoned the village before the Revolutionary War, where they joined the remainder of the tribe in Connecticut on the East side of the Hudson River. The village was located where the village of Margaretville, N.Y. now stands. It is near the headwaters of the East branch of the Delaware. On the west side of the Hudson River, the Mohicans occupied the area from present day Kingston, NY to the present day area of Glens Falls, NY., stretching from the Catskills to the Adirondacks. Following the American Revolution, the thirteen colonies were for the most part, in wilderness. The area now known as the county of Delaware was especially so. The abandoned village known as Pa’Ka-Ta’ Kan, was discovered by white settlers from the Shandaken area in 1762, and had been abandoned shortly before that. Relics and artifacts continue to be found on the site even today. Near the village, one lone Mohican remained. He was an ancient warrior whose name was Teunis. Teunis lived many years near the deserted village, in peace among the white settlers. He always welcomed the whites to his wigwam, and as they sat around the fire he shared with them what food he had available. Often, when his guests were sitting in his wigwam for the evening, Teunis told them the stories of the Catskills and his people. One of these stories was the story of Princess Utsayantha, complete with background, and perhaps with embellishment. His story, the earliest recorded story, I relate to you now, in the belief that it is the true story of Utsayantha and her tragedy. Teunis, a fine friend to the whites, was forced to flee from his home near Pa’ Ka-Ta’ Tan to a lake in the mountains, that now bears his name. He fled after warning the whites of a Mohican plan to massacre them. He found safety at the small lake and was never molested by his tribesmen for his act of kindness to the white men. In the valley of the Esopus Creek, in the Indian village Esopus, (the site of present day Olive Bridge, NY) was a young chief named Tingorus, (who the white man called Tingora). Tingorus desired to marry a beautiful maiden named Teelah-leelah. Unfortunately, another chief, Ashokan also desired to have Teelah-leelah. The two chiefs agreed to fight a duel, with the winner to have the maiden for his wife. At a place called Dancing Rock, the top level of a ledge of rocks near present day Boiceville, NY, high above the Esopus Creek, the two chiefs met for their duel. Many watched their duel. Dancing Rock was a place the Indians observed many of their tribal ceremonies and rituals and held their war dances. It was chosen for its great significance. Both chiefs, Tingorus and Ashokan, fought until the death of Ashokan. Tingorus won the hand of the beautiful Teelah-leelah. The New York City water supply reservoir Ashokan is named after the defeated chief. A daughter was born to Tingorus and Teelah-leelah, and was given the name Genhenwana. The new princess grew up to be a beautiful woman and her beauty became known far and wide. When Pa” ka-Ta” Kan stood with all of its many lodges, a Mohican youth lived there, whose fame spread far and wide. Friend and foe alike, respected him for his courage and cunning, and for his fairness and his foresight, and his skill in the chase and in battle. His name was Ubiwacha. The Munsey Indians, a branch of the Delaware, also called Lenapes, occupied the region around the headwaters of the Delaware. Close to the headwaters of the west branch of the Delaware, by the shores of a lake nestled their village, near the present village of Stamford, NY. Many Mohicans mingled with them and married their women, becoming members of their tribe. Ubiwacha was so greatly admired and respected by these Munsey that they adopted Ubiwacha, the Mohican, and made him their Chief. Thus, Ubiwacha became the Chief of the Lenape of the headwaters of the Delaware. Ubiwacha built a strong lodge, larger than usual, nestled in the trees a short distance from the remainder of the village, and nearer to the shores of the lake. It was protected by the trees from the strong winds of the winter and provided a comfortable home for him. Years passed with Ubiwacha as Chief of the Lenape. He began to hear the stories of the legendary beauty of Genhenwana, the daughter of Chief Tingorus. Ubiwacha was curious and wished to see this legendary beauty for himself. He traveled to the village of Tingorus on the Esopus, at the present site of the Village of Olive Bridge, NY. After staying for a few weeks at the lodge of Tingorus, discussing matters of mutual interest and importance to their two peoples, Ubiwacha won the hand of the Princess Genhenwana. He brought her back to his village by the lake, and built an even larger lodge, well protected by the low lying hills and the pine trees. In the spring, a daughter was born to the happy couple. Ubiwacha named the daughter Utsayantha, meaning Beautiful Spring. She too, grew to be a great beauty. It is said that her eyes were like two twinkling stars. Her black flowing hair glistened on her graceful shoulders, and her voice was soft and musical. As a child, her mother told her of the duel on Dancing Rock When observing the Northern Lights she asked her mother if the lights were not flashes of sunbeams that lingered after sunset. Her mother told her that the lights were in heaven, lighting up the sky with beauty, the souls of men and maidens departed from earth, which had loved but never married. Flitting, lonely lovers looking for each other so their souls could be united in the spirit world hereafter. While on a trip visiting relatives, Genhenwana died from a terrible fever at a place called Garden Rock. Garden Rock was near Haines Falls, where Rip Van Winkle was alleged to have slept for twenty years. Haines Falls is the highest cataract in the Catskills, plunging from 1260 feet high above the Hudson River. The Hudson was called Shatemuck by the Indians. For the next seven years after the death of her mother, Utsayantha cared for her father, Ubiwacha, and his lodge. Many proud warriors came to seek her hand, but to no avail. Her father discouraged these warriors and welcomed only Ungatoah, a medicine man and great magician from the village of Pa’ Ka-Ta’ Kan on the banks of the Pepacton, (Delaware River.) Utsayantha found him and his advances repulsive. Ungatoah was the son of a medicine man of great fame in the boyhood village of Ubiwacha. He was also known for his feats of magic. Ungatoah learned from his father all he knew. After his father died, he became the medicine man. He continued to develop new magic tricks and became one to be feared as well as respected. He wielded great influence among all the Indian tribes. Utsayantha was considered to be the most beautiful maiden of the Mohicans and the Delaware. She was matchless in her charm and beauty. She was modest in manner, graceful in both step and gesture, always gentle and obliging, and always thoughtful of her father. Her name Beautiful Spring, (Utsayantha,) suited her well. Great chief that he was, Ubiwacha feared the magic of Ungatoah and did not want to offend him. He accommodated Ungatoah and tried to convince Utsayantha of his worthiness. Utsayantha was not persuaded. She found the man to be ugly in appearance, and arrogant and offensive in his manner. The more she saw of him, the more repugnant he became to her. One morning, Chief Ubiwacha departed for a council meeting by the Coquago, the West branch of the Delaware, or the Big Pepacton. Later that day, Ungatoah came to Utsayantha. He believed that if he altered the appearance of his face and cast a magic spell on her, she was going to change her attitude towards him and agree to marry him. As Ungatoah approached Utsayantha with his attempts to control her, she was frightened. She feared this man. A white hunter and trapper had lived among the Mohicans for a long time. He had learned their language and their customs. He trapped North in the Adirondacks and returned South to remain during the summer with the Mohicans. The white man, returning from the Adirondacks was coming to see Ubiwacha. He believed the whites and the Indians should forget their ancient quarrels and live peacefully together, as he had done with the Mohicans. He had come to try to make a pact with Ubiwacha that their future might have ties of friendship, and be sealed with peace and love. As the white hunter approached the lodge of Ubiwacha, he came upon Ungatoah, threatening Utsayantha. He immediately went to intervene between them to save Utsayantha from this madman. Ungatoah attacked the white man with his tomahawk. The two men fought for some time and the white man finally killed Ungatoah with his knife planted deeply in the ribs of his opponent. A grateful Utsayantha invited the white man into the wigwam where she bathed his wounds while he rested. Then she prepared a supper for him. Like the bursting of a dam, she poured forth to him, all the troubles she had had with the magician medicine man, and how trapped she had felt because of him. The white hunter fell in love with Utsayantha and his heart went out to her, full of great compassion. The white man asked her to follow him. He wished to lead her through the forest as her husband, taking her west to the Susquehanna, where he had left hidden a birch bark canoe. Together, they could travel west as husband and wife. They could go to an island that he knew of in the river, where he could build a house for her. Deeply moved by his words, which touched her heart to great depths, she returned his professed love and agreed to go with him. They left the lodge in darkness, traveling over the hills and valleys, west to the Susquehanna. New York State highway 23 now follows the route known then as the Susquehanna Trail. The trail began in the present hamlet of North Blenheim on the Schoharie Creek, ending at present day city of Oneonta, on the Susquehanna. Oneonta is called the City of the Hills, and the gateway to the Catskills. It is also the present home of the National Soccer Hall of fame. In that area of the Catskills, it is common for the clouds to lower over the mountains as the air cools during the night, creating a fog like atmosphere. By the time the mid morning sun had lifted the low hanging clouds, the starry eyed couple were skimming west over the water of the river. When evening came, they slept in the height of the moon. When Chief Ubiwacha returned from the council and found his daughter gone, he was furious and promised to exact a terrible vengeance. He called together his warriors, and together they decided to wait for dawn. They then buried the great magician, taking care not to offend his spirit. During the night, Ubiwacha had a vision. In his vision he saw that the Indians were to become overrun by the white men. He saw that fighting them was to no avail. It was better they should make peace and no longer be enemies. The very survival of the Indian depended on it. After the magician was properly buried, a group of warriors was sent out in search of Utsayantha and the white man. They were to be returned for punishment and vengeance. Eventually, the warriors returned, saying the trail had vanished. Utsayantha and her white husband lived and labored on an island in the Susquehanna. They lived happily and peacefully for a few years. The white man grew corn and the Mohawks had an orchard nearby. Fish and fowl were plentiful and they were never molested by hostile Indians. They always welcomed strangers at any time of day or night. The island was located somewhere between the present towns of Unadilla and Owego. There is an island at Owego that is presently called Hiawatha Island that might have been the one where they lived. The local Indians were impressed by the honesty and fair dealings of the white man and by his word being always good. They began calling him, “Great White Chief,” their friend and brother. Eventually, a son was born to them, bringing them closer than ever in their love for each other. One year in the autumn season, the hair of Ubiwacha had turned gray. His gait became just a little less steady than before. A runner returning from a mission to the Mohawks brought news of the chief’s daughter, and where and how she was living. Ubiwachi, a wise and thoughtful man, and reminded of the vision he had the night Utsayantha departed, a message he believed had come from the Great Spirit, sent a message bearer to the “White Chief.” The message told of the vision he had received, and assured that anger, hatred, and a desire for vengeance no longer burned within his heart. The fire of friendship for the “White Chief” and his daughter burned brightly in his lodge. The message declared both of them welcome, asking them to return to his people and fear no evil. The message said the white men have already built their lodge by the Schoharie, and that a just and honorable temporary treaty keeps the peace between them. Utsayantha, full of love, compassion and pity for her father, understood all of his weaknesses. She understood the fears he had of the wiles of the magician, Ungatoah. She longed to see her father again, and to have him see his grandson, believing their presence to bring cheer to his lonely life. Her husband, hunter, trapper and “Great White Chief,” still desired that a bond of friendship between the whites and the Lenape be formed to last unbroken. Utsayantha arrived with her husband and son in late fall. Her husband built a cabin at the side of the lake that now bears her name. In the spring, the white man tried to strengthen the temporary treaty between the Lenape and the whites on the Schoharie, and make it a more lasting one. Ubiwacha, pleased to see his daughter at first, began more and more to seethe with anger, but kept it inside, outwardly appearing friendly. He continued to feel he had been betrayed and it ate at his soul, growing like a cancer. Summer passed and autumn came. The son of Utsayantha and the white man was nineteen months old. One evening, Ubiwacha hid behind a tree. The white man sat outside his cabin making moccasins. Ubiwacha shot the white man in the heart with an arrow. As she saw Ubiwacha standing in the shadows, she plead for mercy for his grandson. Ubiwacha walked away from the cabin toward the village without saying a word. Utsayantha held her son to her breast, sitting beside the body of her husband, wailing in her grief until her wailing was answered by an owl. As the moon rose over the lake, two warriors sprang from behind her. They bound her and snatched her son from her arms. They took him to a waiting canoe. The mother struggled with her bonds until she was finally loose. Free at last, she went to the lakeshore, and saw the canoe glide towards the deepest part of the lake. The two warriors drowned her son while she stood watching, helpless to stop them. When the warriors returned, they left the canoe at the shore. Near midnight, the lake was burnished with the silver of the moon. Utsayantha rose from beside the body of her husband and went to the canoe. She paddled out to the deepest water, where her son had been drowned. She stood in the canoe and paused as she looked towards the shore. With hands raised, she gazed upward. A cloud floating on the gentle breeze began to hide the moon and as its shadow fell on the moonlit water, she plunged beneath it. She was now with her son. During the night, two Mohicans had been watching her from concealment on instructions from her father. They found her body floating near the canoe. All her life, Utsayantha had loved the lake. Her father had made for her a small birch bark canoe, with which she spent many hours exploring the lake. The majestic mountain in the background, she also admired and loved. She loved to climb the mountain and see the view from its heights. The chief kept warriors on the mountain, for anyone approaching their area for many miles could easily be seen and the village warned. The next day, four trusted warriors carried her remains up the mountain following Ubiwacha as he led the way. There, far above the valley below them, they buried Utsayantha in a newly dug grave, in a secret place. Chief Ubiwacha ordered that the name of his daughter’s husband never be spoken. That is why his name is unknown today, and was unknown to Teunis in the 1760’s. We know only that the Mohawks called him the “Great White Chief.” It is believed the Lenape and Mohican did not call him that. Chief Ubiwachi, filled with anger, hate and vengeance, lost forever that which was to him, the most precious of all. His daughter and her love, Utsayantha, the Beautiful Spring. Now you know the legend, as near the truth as can be deciphered, for which Lake Utsayantha and Mount Utsayantha derived their name. I cannot speak for others, but every time I drive by the lake, my eyes are pulled to the mountain and my heart feels a little twinge of sadness for the Indian maiden whose only crime was her love for a man and his son. Get pertinent alerts for The Village of Stamford on your mobile device. Enroll today!